Join the discussion on our forums! 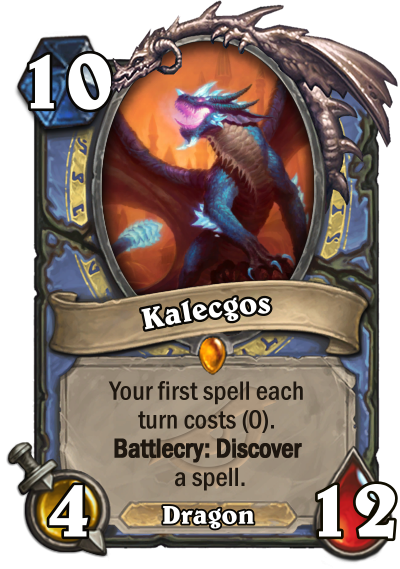 Come discuss Kalecgos over in our dedicated Kalecgos discussion topic. According to https://forgottenrealms.fandom.com/wiki/Blue_dragon, blue dragons are evil.... Evil dragons vs. the league of EVIL! Fun card, it is nice to get big dragons. is this bugged? after it died my spells went to normal? It's a continuous effect, not a battlecry, so once he dies it goes away. Absolutely amazing. From art-work to its use. So overhyped and kinda overated, at least for any kind of control mage in WILD. Has no place because there are already better high mana minions. Don't know about standard. Hyped for this card because it gives immediate value. You can play this and protect it via removal spell in the same turn. However, there are not that many "big" mage spells to play to really take full advantage of this. Pyroblast, Flamestrike, and Power of Creation are the obvious ones.